Interviewed in 1996, Stan Brakhage felt uneasy about becoming a myth in his own lifetime (1). People had come to define him in certain ways, primarily through his work; the badges of “mountain man” and “macho man” in particular seemed to irk him. Recalling how in the 1960s, he moved his family to a mountain cabin located at an altitude of over 9,000 feet in Colorado, he ironically recognised the folly of life there, given that it was a place where “even the Indians wouldn’t live all year round.” Nevertheless, he chose to live on his mountain patch until the end of his days, capturing “the eventuality of everyday living.” With a camera in hand, he set about transforming himself into “a collector of light, 24 hours a day.” As a direct consequence of this new lifestyle, he found himself “constantly breaking down the nightmare of nature – the most beautiful, terrifying enemy that you could possibly have.” Is it little wonder then that his body of work would try to depict his subjective experiences of this perennial mortal battle? The Garden of Earthly Delights can be seen as a companion piece to Brakhage’s previous collage film Mothlight (1963). In both films, Brakhage turned his attention away from previous methods of representation: his subjective takes on family life in “real time”, or the phenomenology of sight alluded to in his painted films. In The Garden of Earthly Delights, Brakhage took pieces of plants he encountered in his everyday life, arranged the assortments of leaves, seeds, stamens, roots and flowers into patterns between two pieces of 35mm film, and optically printed the results. The one minute and 44 seconds of celluloid that ultimately glides, or more accurately clatters, clicks and stutters its way through the projector’s gate is curiously ephemeral yet timeless. It is a rhythmic work that is as beautiful as a stained-glass window, with the projector’s beam of light passing through delicate petals and leaves, but all the more awesome and therefore intimidating for the simple, painstaking, craft behind its ultimate material and experiential form. For it is a film that makes you realise what the ultimate universal experiences for cinema-goers are: the literal passing of time before your eyes, and the seductive power of representation. On first viewing, its 2,496 frames are almost a series of blurs. It is all patches of intense light, colour and movement – treasured moving moments adding up to a whole that dares us to try and decipher its meaning or purpose. Perhaps it is in this sense that Brakhage intended the film as “a homage to (but also an argument with) Hieronymus Bosch”, as stated in the scratched intertitle at the beginning of his film. signified a realm which is opposed to the Kingdom of Heaven and as such must be evil throughout… He creates complicated and puzzling configurations by fusing ideas taken from different contexts and shaping them into one single, visible symbol. Or he takes the text of a proverb or biblical passage and depicts the symbolic wording literally… The result is a fascinating world of monstrous formations, full or wit and surprises, double and triple meanings (2). Brakhage’s film has many physical similarities to Bosch’s painting. For instance, it is structured as a triptych and Brakhage even manages to gather plants identical in colour and translucency to the tempera oils Bosch used in his work. Brakhage’s Garden is broken up into three demarcated sections by alternating black and white leader backgrounds. But Brakhage’s figurative “painting” also seems chaotic, almost nonsensical. You wonder if he has just picked up a bunch of vegetation at random and thrown it into the projector’s mechanism, where it has been unceremoniously chewed up and spat out again into the beam of light. As a way of countering the alien images in Brakhage’s new world, the initial impulse you have is to slow the work down. That way, it is possible to interpret exactly what it is in this chaos of “signs” that you are “seeing”. But then, you falter. For you immediately recognise how this almost sacrilegious act would counter the very reason for the film’s existence in the first place. Slowing it down would either physically or cognitively destroy it: the film could melt, or at the very least, its sublime bustling nature would be altered. Such a desire to master the meaning contained in the film’s frames would thus kill the garden that Brakhage wanted to show us as he experienced it. So, anyway, I did slow the film down. I watched it frame by pristine frame on DVD. 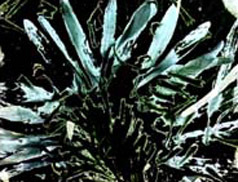 At 24 (or in my case, 25 frames per second), the pieces of flora assembled in the black sections looked as if they were rotoscoped images, as each specimen’s outline is only discernable to the eye. Slowed down to a single frame, however, I was able to see so much more. Initially, each frame’s contents looked like an alien landscape that beckoned to me to come and explore its depths. Far more discernable were the ever-so slight gradations of colour and the intricate patterns of down on a stem, and the veins of a petal or leaf. There was also a more obvious three-dimensional quality: I could literally look through the work rather than just at its surface. Everything appeared as if it were suspended in liquid, like a scientific specimen that had been stained and trapped between two slides of glass under a microscope. When scrolling through the frames, there were various moments where the layering of objects in the foreground and background made it look like the camera’s depth-of-field in each frame was pulling back and forth. Upon repeated viewings on this frame-by-frame basis, I also began to realise that Brakhage had chosen his collage specimens based on the criteria of colour, texture and transparency so that he could allude to Bosch’s “divine” representations. At times, Brakhage even arranged his “figures” according to their common names and physical functions; pollen-laden flowers and pods wither and dry out only to be replaced by a new generation of plants that burst into sexual maturity. In some sections, it looks like the camera pans up an entire plant’s roots, stems, leaves and flowers. It is a delightful celebration of the cycle of life that is much more obviously handmade. Ultimately, the work is a brilliant illustration of Brakhage’s philosophies regarding the persistence and particularities (or peculiarities) of vision. It truly demonstrates how an “eye unruled by man-made laws of perspective, an eye unpredjudiced by compositional logic, an eye that does not respond to the name of everything, but which must know each object encountered in life through an adventure of perception” (6) would, in actuality, see. Moreover, the very act of scratching titles and gluing pieces of everyday natural wonders onto and into the film’s surface, makes apparent Brakhage’s belief in the intrinsic importance of showing the human creator that made the work of art. That is, his endeavour is neither a window onto the world nor a “God-given envisionment” (7). Rather, it is a handmade object, made with love and pride, about the follies of man. As such, it is a little piece of this world’s earthly delights to treasure forever…or at least until the print’s physical demise. Stan Brakhage interviewed by Colin Still, “Encounter 3” in the DVD By Brakhage: An Anthology, the Criterion Collection, 2003. Lotte Brand Phillip, Hieronymus Bosch, Beaverbrook Newspapers, London, 1970, p. 2. Charles De Tolnay, Hieronymus Bosch, Eyre Methuen, London, 1966, p. 31. The kind of kaleidoscopic patterns that swirl under closed eyelids when you press your fingers or fists into your eyeballs. This is said to relate “to the state of mind between sleeping and waking during which images from the subconscious enter the conscious mind.” See Macquarie Dictionary, third ed., Macquarie Library, 2003, p. 937. Stan Brakhage, “Metaphors of Vision”, cited in Scott MacDonald, The Garden in the Machine: A Field Guide to Independent Films about Place, University of California Press, Los Angeles, 2001, p. 68.